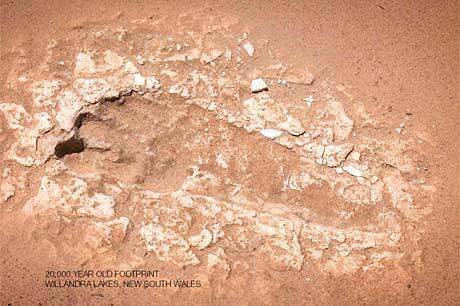 First Footprints takes you back to an Australia before Captain Cook. It is the untold story of the original pioneers of all humankind, a history that began in Australia 50,000 years before modern humans reached America and Europe. With startling new archaeological discoveries revealing how the first Australians adapted, migrated, fought and created in dramatically changing environments. Over 50,000 years ago people made the first open sea voyage in human history to discover Australia: an island continent full of deadly mega fauna and strange plants that had been evolving in isolation for 65 million years. This episode documents the story of how people arrived and thrived in Australia. With startling new archaeological discoveries revealing how the first Australians adapted, migrated, fought and created in dramatically changing environments. When the last ice age hit Australia 30,000 years ago, sea levels dropped 130 meters below today’s level. Deserts devoured 90% of the continent. The greatest drought in human history lasted 10,000 years, temperatures were 6 degrees colder; it was dry and windy, yet people thrived. From eighteen thousand years ago, melting polar ice caps began drowning 25% of Greater Australia. New Guinea and Tasmania became islands. And we meet Narrabeen Man, found under a bus stop on Sydney's Northern Beaches. This was a time of war, inventions, spectacular art and new nations. When much of the world embraced agriculture the first Australians rejected it. They chose instead ingenious land management systems like fire stick farming to transform the harshest habitable continent into a land of bounty.